I can finally check another item off my should-have-done-this-a-year-ago to-do list. 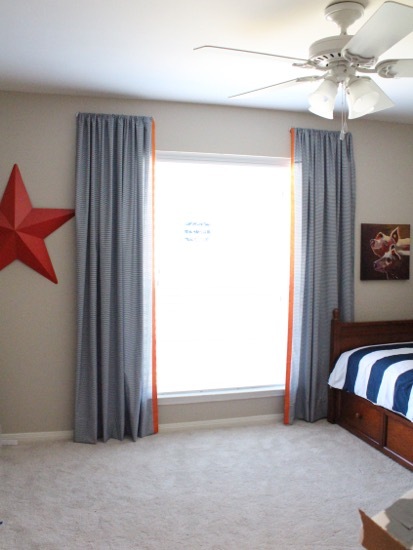 My son’s curtains have been sitting in his closet since we moved in almost 2 years ago. Why has it taken me so long to hang them? Because I am the Master Procrastinator. But they are hung and looking fly if I do say so myself. I hung them the same way I hung them in our previous house – using two Bygel Rails from good ol’ Ikea. They come in two sizes. For the curtains I purchased the shorter ones. These rails are made for the kitchen to hold accessories on. 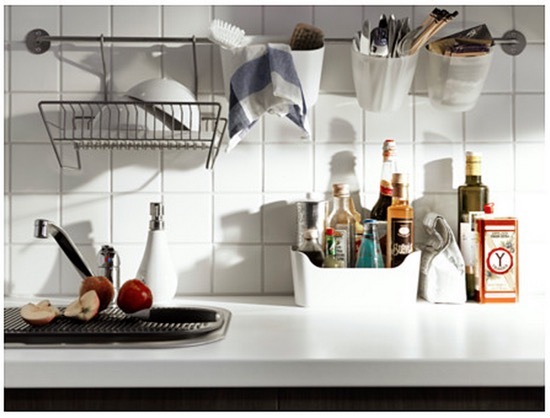 Ikea also suggests using them as a towel rail or to hold pot lids on. I like to “hack” products from Ikea and use them in unconventional ways, so I used these as curtain rods! In our last house I had two extra ones just sitting in my stash and it dawned on me that I could totally use them as curtain rods. They aren’t functional rods where you can drag the curtains across your windows, but they do work great if you want decorative curtains. I left the old rails at the previous house so I had to purchase new ones for this project. They are super cheap though; only $2.99 each. And the poor wrinkled curtains. 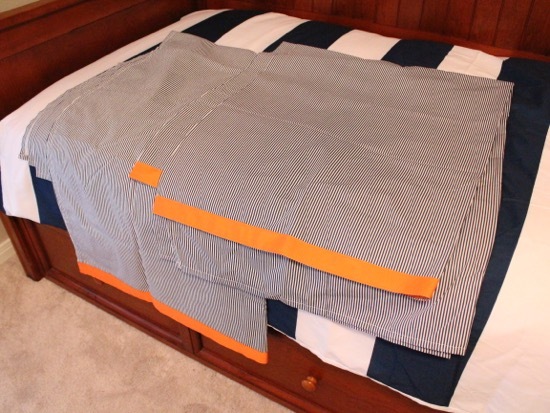 I actually made them using twin sized bed sheets and added some orange grosgrain ribbon down the edge. After ironing, and ironing, and more ironing it was finally time to hang them! I figured out where I wanted the rails hung, threaded the curtains onto the rails, and attached them with some wall anchors. To easily hang the rails I used a level on the rail and just marked where the screw holes were. So much easier than math. Our ceilings are a foot lower in the bedrooms in our current house than in our previous house. Because of this, I realized they would need to be hemmed. I decided to hang them first and then hem them for the most accurate length possible. 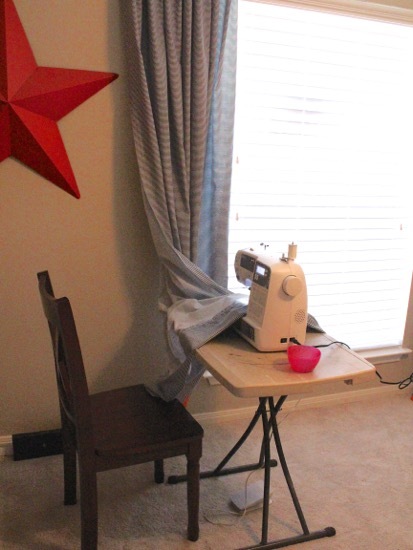 I just set up a sewing machine on a little table and hemmed them right there! It was so easy. I started by pinning them exactly where I wanted them hemmed and then just sewed them at the appropriate length. Now Travis has pretty curtains hung high and wide to accentuate his window and make it look bigger. 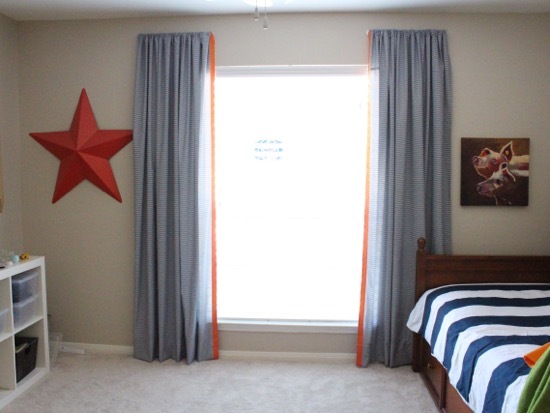 I obviously need to scooch the big orange star over now that the curtains are overlapping it. 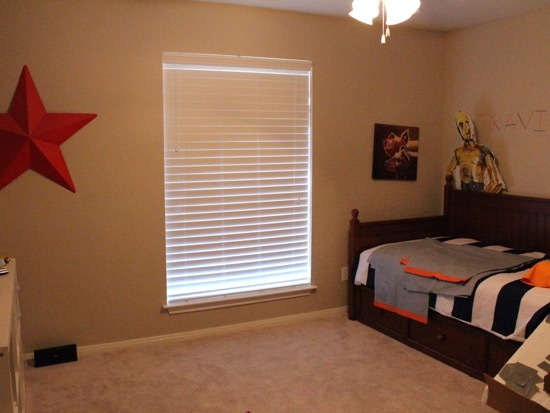 His room will come together eventually. I pretty much put all rooms on hold while renovating the kitchen and dining room. Now I’m slowly starting to make more progress in the kids’ bedrooms. I’d like to just get them totally done once and for all so I can stop tinkering in there and start working on other spaces that need my attention. I would really like to get him a full-sized bedroom set, so we are just kind of in a holding pattern until I decide which set I want and have enough cash saved to purchase it. Here’s a fun side-by-side. 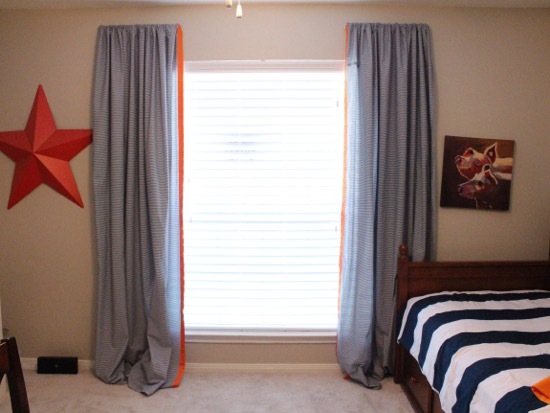 Curtains just make such a huge difference! What a great idea! A much better use for those rods than as a kitchen rail (I’ve actually never even heard of a kitchen rail before). Good job! I love the fact that you repurposed old sheets as curtains. We have several windows in our home that need curtains, and I never even thought of doing that. And if I can find some pretty sheets at Goodwill, it will be such a savings over traditional or even made-myself-from-new-material curtains for our huge windows! LOVE this idea and I’m ordering my rails today. Quick question though…. you said in your post that you ordered the shorter ones. When I go to the Ikea website it only shows one size – 21 3/4″. Is that the size that you ordered to get the look that you have? Thanks!! Yes, my rails are 21 3/4″. Have fun!! This is a great idea! I think I am going to do this in our living room.